Is the opening of Belfast’s 1st abortion clinic a “slippery slope” for N. Ireland? Hoping for North Ireland to make the right choice. The Merriam-Webster Dictionary describes a “slippery slope” as “a course of action that seems to lead inevitably from one action or result to another with unintended consequences.” The online Free Dictionary gives this definition: “A tricky, precarious situation, especially one that leads gradually but inexorably to disaster.” “Slippery slope” is the phrase that came to mind when I read about North Ireland’s first abortion clinic. The Marie Stopes in Belfast has stirred up lots of controversy since it opened last week. Over 300 protesters gathered outside the clinic on Oct. 18to oppose its presence in the city. 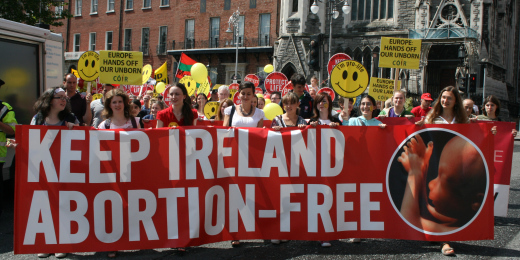 It’s no secret that Ireland is a predominately Catholic nation with strong pro-life roots. Abortion is outlawed in Northern Ireland, except for cases where the mother’s life is in danger. Women who seek abortions for other reasons often travel to Britain to have them performed. Reports estimate that around 4,000 women from the Irish Republic and 1,000 from Northern Ireland travel annually to Britain for legal abortions services. The workers of Marie Stopes are aware of North Ireland’s laws and have promised to abide by them. They stated that abortions by pill will be offered only to women who are less than nine weeks pregnant and have health conditions that would affect their pregnancy. My prayer is that North Ireland will chose not to follow in the U.S.’s footsteps.